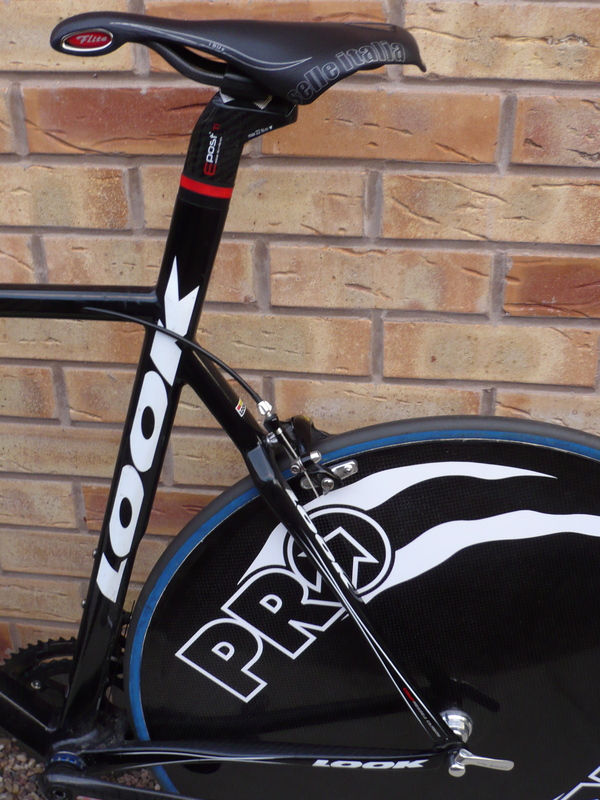 Cappuccino Cycling Club member, Lyn Vardy has got a friend who is currently selling this great Look 586 carbon frame. If you are interested, please get in touch with James, who will put you on to Lyn. 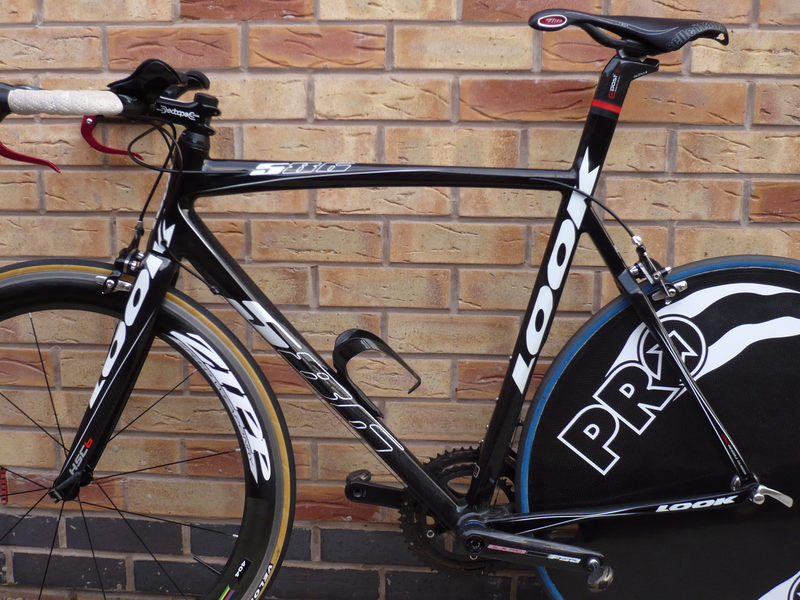 Its a 2009 586 which is a VHM, very high modulus full carbon monocoque including the dropouts on the forks and rear end. I built it from new late last year and I have done 500 miles on it. The frame is unmarked. 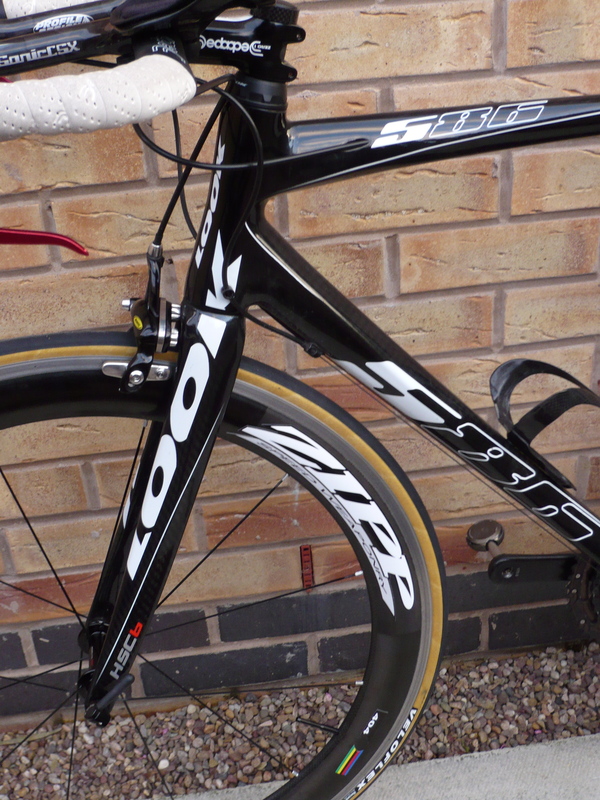 The frame is super top dogs dangly bits, super super light but very rigid. The frame has been known as the best frame to get given on the pro tour for a long time even over a C50 (carbon Colnago glued together and baked by smoking Italians in Ernesto’s garage near Bergamo). It has the top HSC fork with 1 1/8 top bearings and 1 1/4 bottom. I am getting fitter than I thought and am treating myself to a full on TT frame (smaller), hence this beauty is up for grabs. The saddle height is set for me at 75cm from centre of bottom bracket to the saddle rails but can be raised up to 22mm higher. It comes with a nifty cutting guide should a shorter person need a lower saddle height. The forks are cut at 600mm centre of the hub axle to the top of the stem. The carbon/ti integral seat pin comes with 3 different density elastomers that allegedly give varying comfort to the ride. The finish is gloss black but you can see the carbon weave on most of the tubes.